A merchant started his son in life with three hundred rupees, and bade him go to another country and try his luck in trade. The son took the money and departed. He had not gone far before he came across some herdsmen quarrelling over a dog, that some of them wished to kill. “Please do not kill the dog,” pleaded the young and tender-hearted fellow; “I will give you one hundred rupees for it.” Then and there, of course, the bargain was concluded, and the foolish fellow took the dog, and continued his journey. He next met with some people fighting about a cat. Some of them wanted to kill it, but others not. “Oh! please do not kill it,” said he; “I will give you one hundred rupees for it.” Of course they at once gave him the cat and took the money. He went on till he reached a village, where some folk were quarrelling over a snake that had just been caught. Some of them wished to kill it, but others did not. “Please do not kill the snake,” said he; “I will give you one hundred rupees.” Of course the people agreed, and were highly delighted. So the young man went and lived in the stables. His bed was the grass spread for the cattle, and his companions were the dog, the cat, and the snake, which he had purchased so dearly. These creatures got very fond of him, and would follow him about during the day, and sleep by him at night; the cat used to sleep at his feet, the dog at his head, and the snake over his body, with its head hanging on one side and its tail on the other. “Where does he live? I should like to see him, if possible,” said the young man. “Wait for me here,” he replied. “I am not going far. I shall not be long away.” On saying this, he dived into the water and was lost to sight. “Now what shall we do?” said the dog to the cat. “We must remain here,” replied the cat, “as our master ordered. Do not be anxious about food. I will go to the people’s houses and get plenty of food for both of us.” And so the cat did, and they both lived very comfortably till their master came again and joined them. The young man and the snake reached their destination in safety; and information of their arrival was sent to the Raja. His highness commanded his son and the stranger to appear before him. But the snake refused, saying that it could not go to its father till it was released from this stranger, who had saved it from a most terrible death, and whose slave it therefore was. Then the Raja went and embraced his son, and saluting the stranger welcomed him to his dominions. The young man stayed there a few days, during which he received the Raja’s right-hand ring, and the pot and spoon, in recognition of His Highness’s gratitude to him for having delivered his son. He then returned. On reaching the top of the spring he found his friends, the dog and the cat, waiting for him. They told one another all they had experienced since they had last seen each other, and were all very glad. Afterwards they walked together to the river side, where it was decided to try the powers of the charmed ring and pot and spoon. The merchant’s son spoke to the ring, and immediately a beautiful house and a lovely princess with golden hair appeared. He spoke to the pot and spoon, also, and the most delicious dishes of food were provided for them. So he married the princess, and they lived very happily for several years, until one morning the princess, while arranging her toilet, put the loose hairs into a hollow bit of reed and threw them into the river that flowed along under the window. The reed floated on the water for many miles, and was at last picked up by the prince of that country, who curiously opened it and saw the golden hair. On finding it the prince rushed off to the palace, locked himself up in his room, and would not leave it. He had fallen desperately in love with the woman whose hair he had picked up, and refused to eat, or drink, or sleep, or move, till she was brought to him. The king, his father, was in great distress about the matter, and did not know what to do. He feared lest his son should die and leave him without an heir. At last he determined to seek the counsel of his aunt, who was an ogress. The old woman consented to help him, and bade him not to be anxious, as she felt certain that she would succeed in getting the beautiful woman for his son’s wife. She assumed the shape of a bee and went along buzzing, and buzzing, and buzzing. Her keen sense of smell soon brought her to the beautiful princess, to whom she appeared as an old hag, holding in one hand a stick by way of support. She introduced herself to the beautiful princess and said, “I am your aunt, whom you have never seen before, because I left the country just after your birth.” She also embraced and kissed the princess by way of adding force to her words. The beautiful princess was thoroughly deceived. She returned the ogress’s embrace, and invited her to come and stay in the house as long as she could, and treated her with such honour and attention, that the ogress thought to herself, “I shall soon accomplish my errand.” When she had been in the house three days, she began to talk of the charmed ring, and advised her to keep it instead of her husband, because the latter was constantly out shooting and on other such-like expeditions, and might lose it. 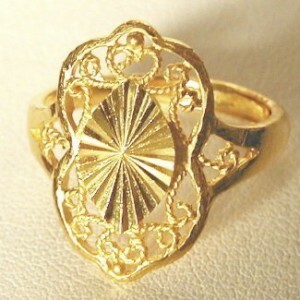 Accordingly the beautiful princess asked her husband for the ring, and he readily gave it to her. The ogress waited another day before she asked to see the precious thing. Doubting nothing, the beautiful princess complied, when the ogress seized the ring, and reassuming the form of a bee flew away with it to the palace, where the prince was lying nearly on the point of death. “Rise up. Be glad. Mourn no more,” she said to him. “The woman for whom you yearn will appear at your summons. See, here is the charm, whereby you may bring her before you.” The prince was almost mad with joy when he heard these words, and was so desirous of seeing the beautiful princess, that he immediately spoke to the ring, and the house with its fair occupant descended in the midst of the palace garden. He at once entered the building, and telling the beautiful princess of his intense love, entreated her to be his wife. Seeing no escape from the difficulty, she consented on the condition that he would wait one month for her. So the cat and dog started off at a run, and did not stop till they reached the place whither their mistress and the house had been taken. “We may have some difficulty here,” said the cat. “Look, the king has taken our master’s wife and house for himself. You stay here. I will go to the house and try to see her.” So the dog sat down, and the cat climbed up to the window of the room, wherein the beautiful princess was sitting, and entered. The princess recognised the cat, and informed it of all that had happened to her since she had left them. “But is there no way of escape from the hands of these people?” she asked. “The ring is in the stomach of the ogress,” she said. As soon as the cat received the ring, she started back with the dog to go and tell their master the good tidings. All seemed safe now. They had only to give the ring to him, and he would speak to it, and the house and beautiful princess would again be with them, and everything would go on as happily as before. “How glad master will be!” they thought, and ran as fast as their legs could carry them. Now, on the way they had to cross a stream. The dog swam, and the cat sat on its back. Now the dog was jealous of the cat, so he asked for the ring, and threatened to throw the cat into the water if it did not give it up; whereupon the cat gave up the ring. Sorry moment, for the dog at once dropped it, and a fish swallowed it. “Oh! what shall I do? what shall I do?” said the dog. “All right,” said the dog, and at once ran off. He soon came back with a dead lamb, and gave it to the cat. The cat got inside the lamb and lay down, telling the dog to go away a little distance and keep quiet. Not long after this a nadhar, a bird whose look can break the bones of a fish, came and hovered over the lamb, and eventually pounced down on it to carry it away. On this the cat came out and jumped on to the bird, and threatened to kill it if it did not recover the lost ring. This was most readily promised by the nadhar, who immediately flew off to the king of the fishes, and ordered it to make inquiries and to restore the ring. The king of the fishes did so, and the ring was found and carried back to the cat. “Come along now; I have got the ring,” said the cat to the dog. “No, I will not,” said the dog, “unless you let me have the ring. I can carry it as well as you. Let me have it or I will kill you.” So the cat was obliged to give up the ring. The careless dog very soon dropped it again. This time it was picked up and carried off by a kite. “See, see, there it goes – away to that big tree,” the cat exclaimed. “Oh! oh! what have I done?” cried the dog. The dog, now thoroughly ashamed of itself, begged the cat’s pardon for all the trouble it had given. It was afraid to ask for the ring the third time, so they both reached their sorrowing master in safety and gave him the precious charm. In a moment his sorrow was turned into joy. He spoke to the ring, and his beautiful wife and house reappeared, and he and everybody were as happy as ever they could be.